Fran Martin became a member of The Bootmakers of Toronto in 1987 and The Stormy Petrels of B.C. in 1988. She has attended several Sherlockian conferences including: In 1992 "Aspects of Holmes" in Bradford, England (hosted by The Northern Musgraves); In 2006 "ACD at 35" in Toronto (hosted by The Bootmakers of Toronto); 2013 "Sherlock Holmes Through Time & and Place" in Minneapolis (hosted by The Norwegian Explorers); 2014 "Gillette to Brett IV" in Bloomington (hosted by Wessex Press); 2015 SherlockCon in Seattle; 2015 "A Scintillation of Scions VIII" in Baltimore (hosted by Watson's Tin Box); 2016 "The Misadventures of Sherlock Holmes" (hosted by The Norwegian Explorers); in 2018 in Dayton, Ohio for the "Holmes, Doyle & Friends" conference (hosted by the Agra Treasurers). 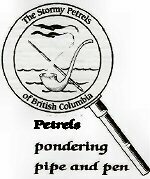 Fran has held several positions with The Stormy Petrels of B.C. including secretary, vice-president, special events coordinator and is currently president and editor of the "Petrel Flyer". She was honoured with being awarded the title of "Master Bootmaker" in 2014. She was very pleased to present a paper to a meeting of Sir Hugo's Companions in Chicago in 2017. Fran has contributed articles to Canadian Holmes magazine, the Watsonian and Chris Redmond's "About Sixty" and "Sherlock Holmes is Like...". In May, 2018 she attended the 78th annual Speckled Band of Boston dinner. She was very honoured to have been one of the first women invited.